Everyone loves tailgating! You're standing out in the cold, drinking beer and eating delicious snackies! Make sure to keep warm and full with these tasty game-day recipes! Perfect for tailgating, Sunday Night Foot Ball, or the Super Bowl!! 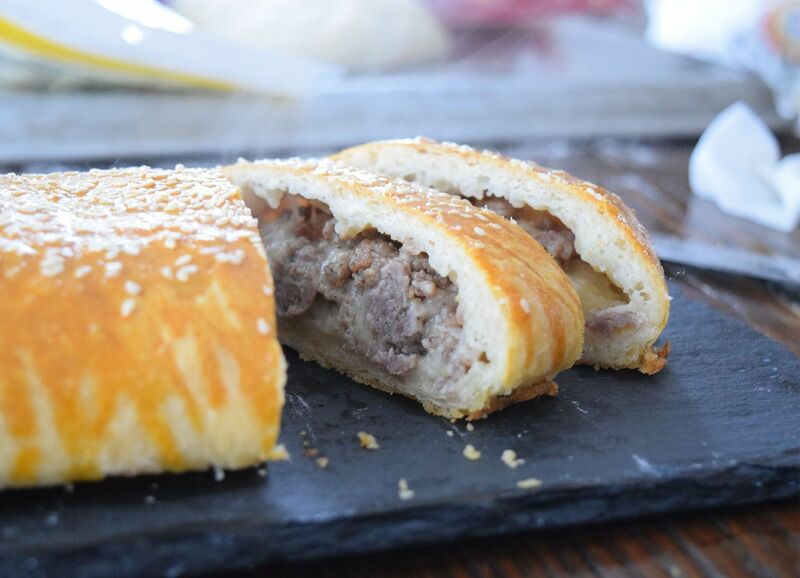 This sausage bread can be made way in advance and reheated on the morning of the big game! It's cheesy, meaty, and so hearty. It will be gone in two seconds so make sure to bring two loaves! These burritos are so easy to whip together at any time! They freeze well and can be reheated in a snap! Only a few ingredients make them super simple and super tasty! Make a big tray of them for your next tailgating event! You and your friends will be in burrito-football heaven. OMG, these crab rangoons in egg roll form are the bomb. They are better served up hot, so they may be best for in home football watching, but I would eat them anywhere, anytime! Creamy scallion cream cheese filling and tangy sweet and sour dipping sauce make these babies to die for (and so cute!)! Why is the salsa in a Mexican restaurant always so good?? I often wondered this myself, until I figured out it wasn't fresh tomatoes I was missing but canned ones! This salsa is whipped together in a blender or food processor and is ready to serve in minutes! Make it as spicy as you want and get to dippin'! You can also add it into burritos or top it on scrambled eggs! Nothing beats chili on a cold winter day. Make it with or without beans and serve it with some hearty cornbread, shredded cheddar, and sour cream. It's an easy one-pot meal to bring to the big game! Breakfast pigs in a blanket? They are ridiculously easy and are ridiculously tasty! Roll up store-bought crescent rolls with homemade scrambled eggs, crispy bacon and a sprinkling of cheese! A new twist on a classic porky app. It's so easy to make a giant pitcher of this delicious sangria! Simply throw all of the ingredients into a portable pitcher and you've got an easy and tasty game day drink! This bacon cheese ball is full of goodness...cheddar cheese, scallions, fig jam, and of course, bacon! It's soooo easy to throw together for any party and as a bonus it looks just like a football when you morph it into that classic shape!